What do you do when stuck in bed? I like to be kept busy so it's a bit hard on me when I have to stay quiet and wait to feel better. 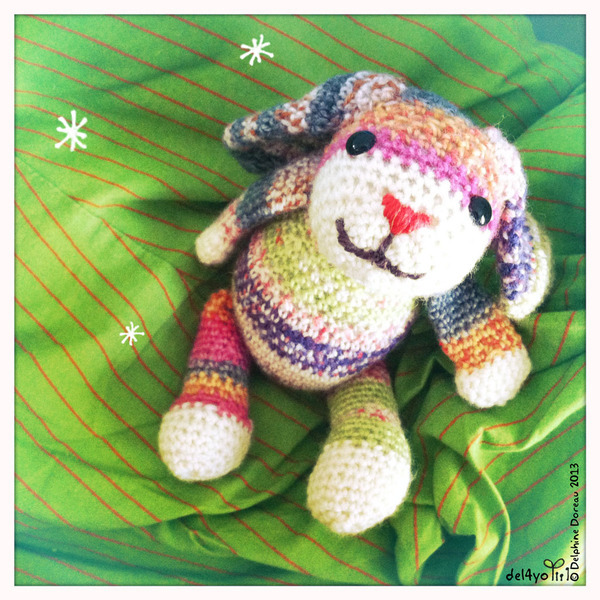 I also felt a bit sad for my son, waiting for his Maman patiently, so I made him an amigurumi bunny. I am a bit too picky and impatient to really follow instructions. I began to make the head and body of the bunny in the Simply Crochet issue 2 but I didn't like the hands,feet and ears so I replaced them with simple, geometrical progressions close to the famous Amineko model . I picked a variegated sock yarn because I get bored easily, but made sure to make the nose and hands with white yarn to make them more recognizable. I used the Darice eyes which are the cheaper on the market, with shank and washers for safety. I made sure that they were placed, just like on my drawings, exactly equidistant from ears and nose. The most difficult part was to embroider the nose...I used a tutorial from Beautiful Nightmare , but lightly traced the smile with a pencil before embroidering. I wanted it cheerful and quiet at the same time, what do you think? My son is 6 but fortunately not too old for hugging cute amigurumis. This little bunny is now on his bed and loves storytelling time. Ce post est un petit peu long pour être traduit...faite coucou dans les coms si vous avez besoin d'aide pour comprendre.